I thought I would do a quick overview of my favourite make-up brush EVER that I could no longer be without. It's the MAC 239 Eye Shader brush. 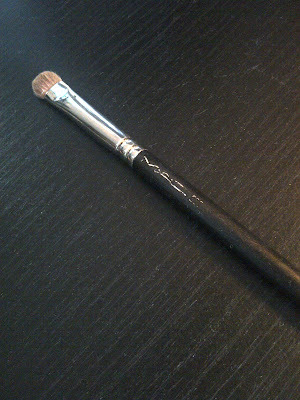 Since purchasing this brush, the application of my eye make-up has become a doddle. 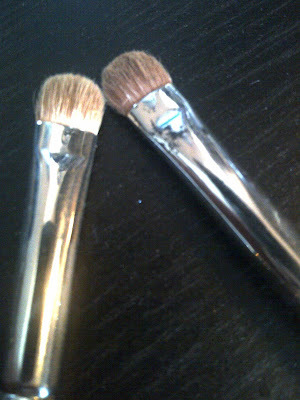 As most of you probably know, MAC brushes are of a high quality and are made using the finest materials. Yes, the price tag certainly isn't appealing .. £19.00 for a brush is a LOT of money to spend but trust me, sometimes that little bit extra is worth it. I got my 239 just over a year ago now and have used it almost EVERYDAY since. The bristles are really dense and 'sturdy', if that makes sense? 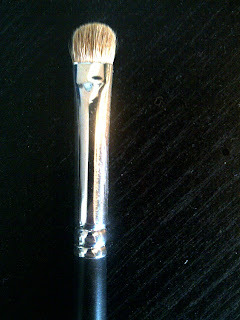 Any colour/pigment I want to apply just glides onto the lid with ease when using this brush. It is the perfect brush for packing the colour on all over the lid and I have noticed I get a more vibrant colour pay-off when using this brush compared to other brushes. It has also retained it's shape over the past year and hasn't shed many bristles unlike cheaper brushes. It also washes really well and looks brand new again after a good scrub. I actually thought I had lost my 239 last new years eve as I just couldn't find it anywhere. I rushed out to buy a new one straight away which goes to show how much I love this brush. Just incase your wondering, my original one did show up in some old eye-shadow palette I used once on new year and never touched again. Doh. Not that I'm bothered though, I now have two which comes in pretty handy for using different colours on both of the brushes. The ONLY bad thing I would point out about MAC brushes is the fact the MAC sign easily wears off, as you can see from my picture. However, if you paint the sign with a clear nail polish when you first get your brush, apparently it protects it from fading away. *top tip*. I will definitely be trying that next time as it looks a bit naff when it's all faded off the brush handle. If I were to only have one MAC brush it would certainly be this one as it is the one I reach for most frequently and the one I find makes the greatest difference to the overall look of my make-up. Do you own any MAC brushes, if so, which are you faves?! Highly recommend this one :) worth every penny! They are really good! Expensive but an investment as they last a lifetime! I hear good things about 217 too, i wouldn't mind trying it! No problem, your blog is great! 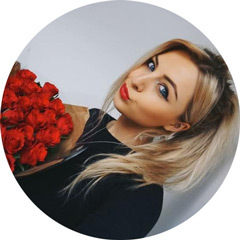 Thanks for following mine, appreciate it! x x x.